The summit meeting of the leaders of the Group of Twenty (G-20) in Cannes last week was overshadowed by a surprise announcement by the Greek prime minister that he proposed to hold a referendum on the acceptance or otherwise of the austerity package he is committed to. The uncertainties of the outcome would have opened the proverbial Pandora’s Box of the painfully negotiated structure for the European Financial Stability Facility. No wonder, France and Germany read the riot act to the prime minister, and he hastily withdrew the referendum proposal. One wonders, of course, whether the possibility of a “revolt of the proletariat" was not the real reason. The closer one looks at the global political economy, the more he is reminded of that expression coined by Arnold Toynbee, the British historian, in his monumental, 12-volume, A Study of History, focusing on the growth and decay of civilizations. To oversimplify his thesis, Toynbee argued that civilizations continue to develop so long as they are led by “creative minorities": such minorities do take more from society than the average citizen, but their contribution to societal development is even more, and the masses (the “proletariat", as Toynbee calls them) accept the inequalities. In course of time, creative minorities become “dominant minorities", who continue to take more from society without contributing anything comparable in return, leading to a decay of the civilization, and a revolt of the proletariat. Turning to economic issues generating mass movements, two phenomenon come readily to mind—the way the Tea Party has gained veto power over fiscal policies in the US within a few years of its birth, and the way right wing parties are gaining strength in several European countries. 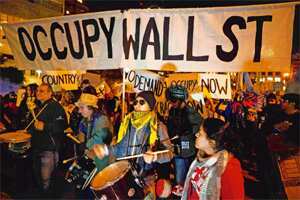 But perhaps the largest mass upsurge in the West is the so-called “Occupy Wall Street" movement. It does not seem to have any leaders or a clear agenda, but within a few months, similar protests have taken place in a thousand cities. The driving force is obviously the perception that at least some Western democracies, particularly the US, have become governments “of the 1%, by the 1%, for the 1%" (Joseph Stiglitz, recent article in Vanity Fair). Capitalism, as it has evolved in the West over the last three decades, has increased income inequalities phenomenally; the top 1% of Americans take almost a quarter of the nation’s income (12% 25 years back) and command a 40% share of its wealth (33%), even as the income of the bottom 80% has either gone down or stagnated in real terms. The wealthy manipulate the tax laws to make sure that they pay as little as possible. The perverse result is that the secretary of the hedge fund manager today pays a higher rate of tax than her boss, the bulk of whose billion-dollar income is considered capital gains subject to lower levels of taxation. The proletariat is obviously very angry at the extremely wealthy dominant minority created by the financial sector, deregulated over the last 30 years. It was, of course, the deregulation and the excessive speculation in the banking sector that led to the financial crisis of 2008, and the global recession that has increased unemployment. The huge cost, counted in trillions of dollars, is being borne by the real economy, by the proletariat, even as there is no remorse, let alone embarrassment or shame, on the part of the Wall Street: top managers and traders (i.e. speculators) continue to enjoy huge bonuses, exploiting loopholes through a creative interpretation of rules imposed after the crisis: governments and banks have lost the trust of the citizen. The perversity of today’s capitalism is that it is rewarding the speculator, whether for a bank or for a hedge fund, far more than say the inventor of the Internet. They are the dominant minority, as distinct from the creative minority of a much smaller number of billionaires such as Steve Jobs. Recently, even the Pope criticized “the extreme injustice of a system that taxes working people for necessities, but allows speculators to avoid even the most basic responsibilities". In fact, recent developments have provoked many thoughtful and sober analysts to question the sustainability of the present model of democracy and capitalism: among them Martin Wolf (Financial Times, or FT, 28 October), Kishore Mahbubani (FT, 21 October), John Kay (FT, 11 November), Simon Johnson (Bloomberg, quoted in The Economic Times, 8 November), Joseph Stiglitz and others. Jagdish Bhagwati recently commented how Wall Street has perverted the basic model of capitalism, namely “creative destruction", into the “destructive creation" of ever more complex derivatives! Sadly, the G-20 summiteers had no time to debate such fundamental issues. A.V. Rajwade, is a risk management consultant, columnist and author.